CORDOBA: Maria Teresa Andruetto is the first Argentine author to win the prestigious Hans Christian Andersen Award, the “Nobel” prize for children’s literature, organized since 1956 by the International Board of Books for Young People and presented each year at the Bologna International Children’s Book Fair. She lives in blissful seclusion at the “sierras” of Cordoba (900 km Northwest of Buenos Aires). She doesn’t own a cell phone, loves family, cats and dogs, and didn’t quite get what I meant by a Skype conference in order to interview her for Publishing Perspectives. Born in 1954 amidst a family of immigrants from Piamonte, Italy, in what then constituted the Wheat Belt of the Argentine Pampas, Andruetto is convinced that her writing wouldn’t be the same if she hadn’t “grown up in a small town where the children of Italians weren’t seen as an oddity.” Arroyo Cabral, the town in question, was in those distant days the other melting pot of the Americas: Syrians, Lebanese, Turks, Basques, Galician, Jews, lived in harmony, striving to achieve (the later defeated) dream of “making it” in the New Continent. “You write with what you are; stories are experiences you need to share after they’ve been washed by the waters of time,” she says. “A husband who suffered political exile, having to provide for my daughters in dire times, my short but meaningful exile in Patagonia, my contact with people of every walk of life, an early developed social awareness, are the fabric of my books.” That, and the influence of her father, an Italian partisan who found a way to leave Italy in 1948 when earning overseas passage in the post-war years was extremely difficult. You should know: Andruetto’s books for children and young adults are closer to Louis Sachar’s Holes than to Neil Gaiman’s Coraline. Not surprisingly, asked about new technologies and the opportunities they open for children’s books, Andruetto downplays their importance as a creative tool. “I write stories and those stories get edited and then published. The container doesn’t mind because it’s external to writing,” she adds, as somebody so familiar with the codex format that it has disappeared in her eyes as a restriction shaping literary creation for centuries, just as apps will shape a new kind of storytelling. Andruetto has been involved with children and young-adult fiction for over 30 years, but not exclusively as a writer. “It’s been a lifetime working from the grassroots, training school teachers in new competences, introducing contemporary children fiction in schools and libraries. When I was young, I thought I would be happy if I could write full-time, but now I know that I need these other activities to keep focus. Having all the time on the computer, I would start myriads of different books at the same time,” she laughs. 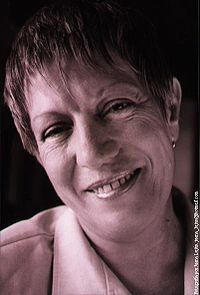 Maria Teresa Andruetto’s works are published by Random House Mondadori. She’s been translated into German, Portuguese, Italian and Galician and she sees the Hans Christian Andersen Award, and other prizes she’s already won, as an opportunity to reach more readers.